Here’s a new way to use kefir—make a frozen dessert. The fermented beverage, similar to drinkable yogurt, is a great source of a wide variety of good-for-you bacteria—probiotics. But not everyone loves the taste right out of the carton—tangy, a little sour, sometimes yeasty, often with some effervescence. Fortunately, like plain yogurt, kefir is a great cooking ingredient. It’s fine to freeze it—the “good” bacteria survive well. To get the most benefit, eat this dessert within about a week of freezing it. But it’s so delicious, it may be gone long before that. Whisk egg yolks, coconut milk and honey in a small saucepan until blended. Cook over medium-low heat, stirring constantly, until honey melts and mixture is thickened and coats the spoon, 5 to 7 minutes. Let cool. Pour into a blender container or a bowl, add remaining ingredients, and either process until smooth or stir until blended. Cover and refrigerate until well chilled. Freeze the mixture in an ice cream maker, according to your machine’s directions. Transfer to a covered, airtight container, and freeze until firm enough to scoop. (If you don’t have an ice cream maker, pour the mixture into a rectangular baking pan and freeze, stirring every half hour, until firm enough to scoop.) For serving, let stand at room temperature until it softens slightly, about 10 minutes. Keep unused portion frozen for up to seven days. Before serving, toast the remaining 1 tablespoon of coconut and let it cool. 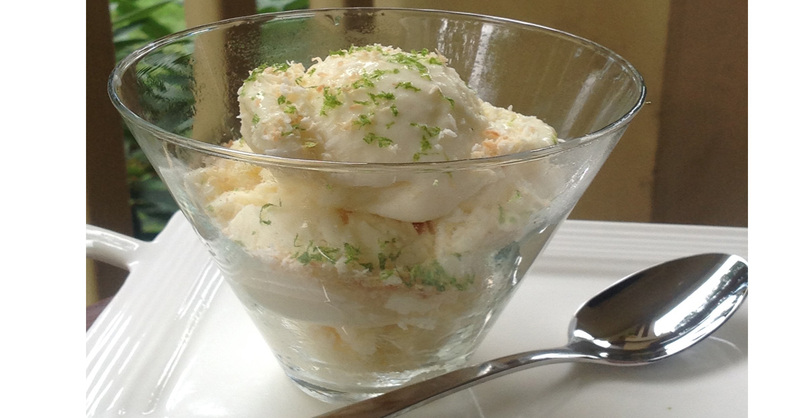 Sprinkle ¾ teaspoon of toasted coconut and a little lime zest on top of each serving. Kefir substitutes well for dairy products in many recipes. The key caveat is to keep it raw, since cooking will kill the healthy bacteria. For example, if you use it as a marinade to tenderize and flavor meats, while you may get good taste and nutrition, you’ll miss out on the probiotics and the gut benefits. That’s fine, as long as you know. • Substitute for buttermilk in creamy salad dressing recipes and dips. • Use instead of yogurt in smoothies. • Blend two cups of fruit with one cup of kefir, and garnish with mint or basil sprigs for a refreshing cold soup. Or blend plain kefir with two cups of peeled, seeded and diced cucumber and a sprig or two of dill or tarragon for a cold vegetable soup. • Pour into your morning cereal. Or make your own muesli: Combine one cup of kefir and one-half cup plus two tablespoons of organic rolled barley or oats and one-third cup of raisins. Cover, and let stand overnight. Serve with fruit, nuts or seeds…or thin with a little more kefir and drizzle with honey. • Make kefir cheese balls for a party snack or salad topping. Olive oil adds great flavor and helps them keep them their shapes. Here’s how: Line a colander with several thicknesses of cheesecloth, and place the colander over a quart-size bowl that will allow the colander to hang an inch or so above the bottom of the bowl. Pour one quart of plain kefir into the cheesecloth, and tie up the ends. Let the kefir drain at room temperature for one day or until it’s thick enough to be molded. Scrape the kefir “cheese” into a glass bowl or covered container, mix in one-half teaspoon of sea salt, one-quarter teaspoon of freshly ground pepper, and, if desired, one or two tablespoons of minced fresh herbs. Cover tightly, and refrigerate for two hours, then scoop the cheese into ping pong–sized balls to be used as an appetizer or for a buffet…or use a melon baller to make bite-sized balls for arranging on a salad. Fill a quart jar halfway with olive oil, add a three-inch sprig of rosemary and drop in the kefir balls. Top with more olive oil, cover tightly, and refrigerate for up to two weeks. Do you have your own kefir recipe? Share it in the comments section below!